THE RANELAGH SQUARE owned by controversial businessman Noel O’Gara is to be put to public auction at a sale of distressed property next month. Dartmouth Square, which has been at the centre of controversies since 2005, is among 109 lots to be sold at an Allsop Space auction on December 4 – just one day before the Budget. The property is currently owned by Marble and Granite Tiles Ltd, a company owned by Noel and Naramon O’Gara, which was put into liquidation last year. It is being sold by the liquidator, Tom Murray of Friel Stafford Corporate Recovery. A reserve price of €140,000 has been put on the two-acre site. It emerged in 2005 that O’Gara – who regularly runs for public office on a platform of property rights – had bought the freehold on the square from a descendant of its builders, who had arranged a sale to Dublin City Council but who had never actually received his payment for the land. O’Gara later tried to run the square as a car park and then to run a tile sales business from the area, before then running it as a camp site, but ran into objections from local residents at each occasion. A deal was later reached – after pressure from then-Green minister John Gormley, who was a TD for the area – for the park to be run as a public amenity, an arrangement which remains in place. Athlone native O’Gara also claims to own land at in Terenure on which Dublin City Council runs a pay-and-display car park – and in 2010 had begun using a heavy duty bolt-cutters to remove City Council clamps from vehicles parked there without paying the appropriate fee. 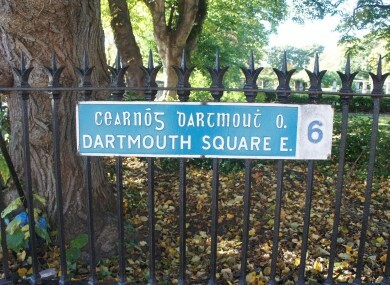 Email “Dartmouth Square among lots in latest distressed property auction”. Feedback on “Dartmouth Square among lots in latest distressed property auction”.